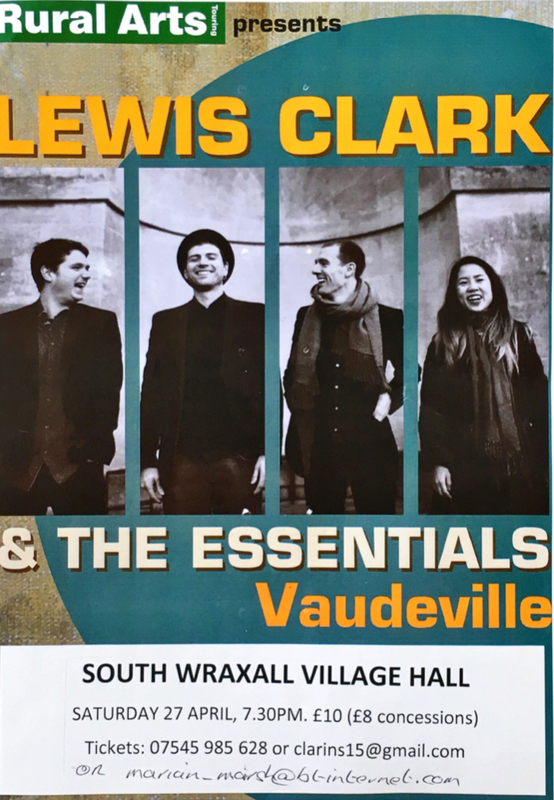 Lewis Clark & The Essentials became a fully-fledged band in September 2015. Based around the core trio of Lewis Clark (guitar & vocals), Pasquale Votino (double bass) and Tom Gilkes (drums), the group introduces the talents of Annalise Lam (violin/clarinet) and Paolo Guerriro (alto sax) to combine their diverse and shared interests in blues, folk, jazz and soul in a distinctive and dynamix live sound. Tickets £10, Concessions £8. Pay Bar. Everyone is welcome to Toddlers Tattle tomorrow, Wednesday, 9.30 -11.30 at the Village Hall including banana cake and cheese scones. Play activities and fun for little ones, as well as a chance to catch up will other villagers. And every 1st and 3rd Wednesday of the month. On Sunday morning, from 9 o’clock, we welcomed a steady stream of visitors to South Wraxall Village Hall to enjoy one more breakfast before summer comes. There were many familiar faces and one or two first-time customers. There were large tables of young parents and small children from the village and visitors from Bath, Bathford and nearby villages, as well as older, long-time residents of South Wraxall. People lingered to chat and catch up on local news,moving from table to table to meet new friends. All our helpers worked extremely hard to make it an enjoyable and rewarding morning. Donations gave us a profit of £442, after paying for the food, towards the upkeep of St James’s Church. This brings our season of breakfasts to a successful conclusion. We would like to thank everyone for their continued support, and look forward to serving you Afternoon Tea in the summer months. We are excited to announce that Kevin Browns good time roots and blues band The Shackdusters will be performing live at the club on 26th April 2019. Get in early to get a good seat. Music from 8.30pm. Following Kevin Browns storming guest appearance with, Texan luminary, Guthrie Kennard last November he was so keen to return to South Wraxall Club with his band that we booked them at their first available opportunity. Please come along and enjoy the evening and show your support for live music at the club – cheer, whoop and applaud, drop a few quid in the jug when it comes round (or better still one of those annoying plastic fivers) have a jolly good time and be smug in the fact that you won’t get music as good as this in a venue as good as this anywhere else. We look forward to welcoming our regular customers as well as ‘first-time’ visitors to our Village Breakfast this Sunday, 14th April from 9:00 am in South Wraxall Village Hall. We will be serving Full English Breakfast plus toast and marmalade, fruit juice, tea and coffee. Congratulations to all prize winners, you will be contacted personally regarding payment. RENEW & JOIN FOR 2019! For those of you who paid an annual subscription by cash or cheque – you will need to renew your subscription of £24 per ticket for 2019 to retain your numbers. Why not increase your chances of winning?! Take the plunge and buy another ticket! Buy one on behalf of a family member, encourage a friend. Additional application & standing order forms here and spread the word! Any questions or to reserve a specific number…. Good luck in the next draw in July 2019! We are serving one more Village Breakfast, on Sunday 14th April, before summer comes along. Do join us in the friendly atmosphere of South Wraxall Village Hall, where Full English Breakfast will be served from 9am until at least 11.30am. We are using local produce where possible: the Walker family’s organic free range eggs and black pudding made and donated by Rob from The Longs Arms. All proceeds will go towards the upkeep of St James’s church, so you are asked to be as generous as possible. For the ‘Full English Breakfast’ which also includes toast and home-made marmalade, tea/coffee and juice you are asked to donate a minimum of £6 (children half price).